Does the New York Times Have the World's Worst Coverage of the Paranormal? But this isn't how the New York Times has been handling the paranormal during the past 30 years. During the past 30 years, the New York Times seems to have had the worst coverage of the paranormal given by any major newspaper. While it has outstanding coverage of politics, world affairs, sports, and entertainment, the paper will typically not cover important news about the paranormal. In the very rare cases when it does provide coverage of the paranormal, the New York Times almost always gives us coverage that is heavily biased, inaccurate, or uninformative. Judging from the Google query below, the New York Times had no coverage at all of this dramatic story in 1997, the year it occurred. 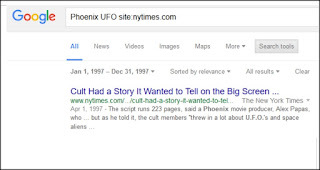 The search returns only one result, which is not coverage of the Phoenix sightings. 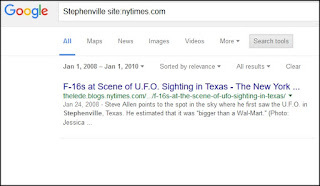 Another very dramatic UFO news story was the spectacular UFO sightings that occurred in Stephenville, Texas in January 2008. 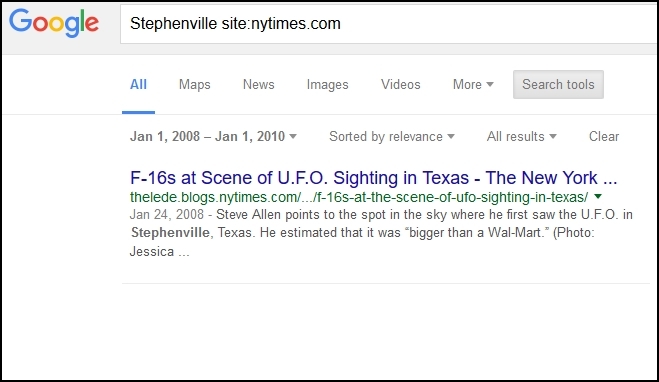 The ABC News story here gives some of the astonishing details of the story: “More than 30 residents of Stephenville, Texas, claim to have seen a UFO, described as a mile-wide, silent object with bright lights, flying low and fast.” A witness named Allen said the object moved with amazing speed without making a sound. “It was so fast I couldn't track it with my binoculars,” said another witness. Another witness (an Air Force technician) said it was a UFO. Now surely a sighting this spectacular deserved significant coverage in the New York Times – but it apparently did not get any real coverage. Because when I do the Google query below (limiting the search time between 1/1/2008 and 12/1/2008), it shows no signs of any coverage that appeared in the regular edition of the New York Times. The query produces only one hit, and that is for some blog post that appeared in the online edition of the New York Times. The post is a dismissive one, with the title “F-16s at Site of UFO Sightings in Texas.” The idea seemed to be to make people think that the UFO's were just jets (which is pretty ridiculous considering the mile-wide length reported). Let's look at some other types of paranormal stories, and the dismal or nonexistent coverage they received in the New York Times. One of the more dramatic scientific studies in recent years was the “Feeling the Future” study done by Cornell professor Daryl J. Bem. Published in a scientific journal in 2011, the study produced evidence of precognition, a paranormal human ability to have knowledge of the near future. Later Bem published a meta-analysis of 80 studies, showing that the effect had been well replicated by other researchers. Other than an article on animal precognition, the only story or article I get on precognition is an utterly hostile opinion piece entitled “ESP and the Assault on Rationality,” which refers disparagingly to Bem's results (without giving any substantive critique), but does not describe them in any detail, nor contain a link to them. Similar queries using Bem's name fail to produce any coverage of Bem's results. 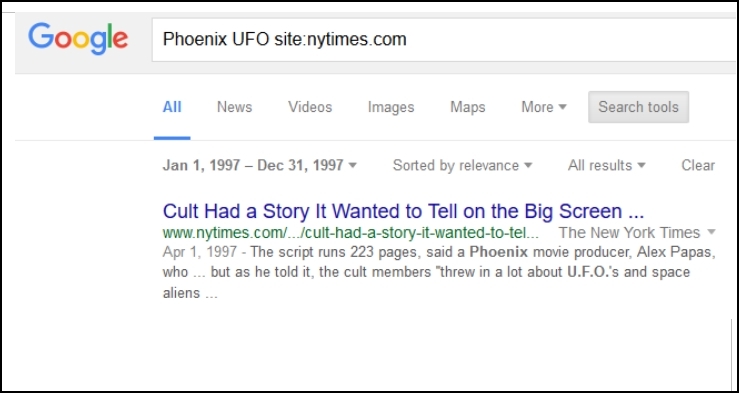 Again, the New York Times failed to cover an important paranormal news story. In 2014 an important piece of paranormal news was the scientific paper presented at the annual Parapsychological Association conference by Dr. Diane Hennacy Powell. She reported ESP experiments with an autistic child that had spectacular levels of success, including 100% accuracy on two random numbers of 8 or 9 digits, and between 81 to 100% accuracy on sentences of between 18 and 35 letters, along with numerous similar results.. Did the New York Times ever give this important news to its readers? Apparently not. The following Google query returns no results. 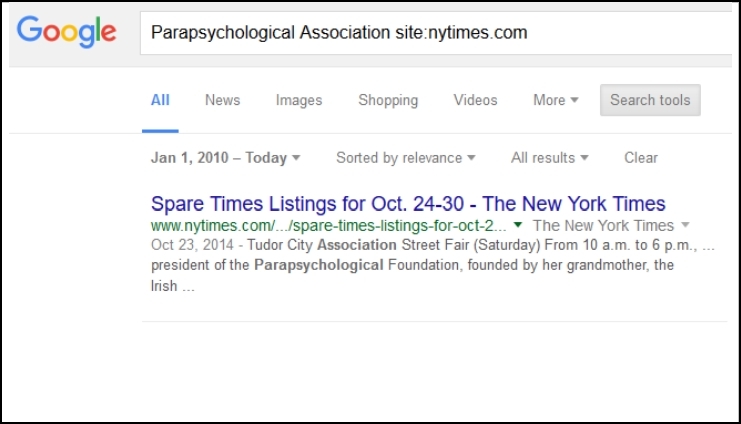 I then found out that in the past six years the New York Times has had no coverage whatsoever of the research of the Parapsychological Association, currently the main organization for paranormal research (and an organization with annual conferences that present research). The query below gives only one result, which is merely a passing reference to a street fair. Then there was the Lily Groesbeck story, one of the most dramatic paranormal stories in recent memory. About 10:30 PM on March 6, 2015, a car carrying Lynn Groesbeck and her 18-month-old daughter Lily flipped over and crashed into the bottom of a small river. Apparently the mother was killed by the impact, but her daughter survived. Strapped into her toddler car seat, the toddler hung upside down in the overturned car, only inches from icy water below her. About 14 hours later an angler noticed the car, and called the police. Three police officers and a fireman arrived, and tried to flip over the car. All four of them reported a voice coming from the car – a car containing no one but a long-dead woman and an unconscious baby. Their exact statements are recorded here. Somehow 4 men flipped over an upside-down car, and then extracted the baby, who astonishingly survived the incident without serious injury. Shortly thereafter a dramatic “chest cam” video of the incident was published on youtube.com. It corroborated the men's story, because in the video you can hear one of the men loudly and clearly yelling “we're helping, we're coming,” just the type of thing someone might say if a voice was coming from inside the car. Did the New York Times cover this remarkable story? Yes they did. But no paranormal aspect of the story was mentioned, and no mention was made of the four reports that a voice came from inside the car. No further article in the New York Times mentioned any account of the paranormal voice coming from the car. A Soviet censor might say, "Good work." Another extremely interesting paranormal story is that of the Global Consciousness Project. Over the past 16 years the project has gathered evidence for a paranormal effect of human consciousness on random number generators. The cumulative evidence gets better every year, as the effect keeps showing up. The query reveals that the last story the Times had on the project was in 2003. That was a dismissive “worse-than-censorship” type of story that inaccurately describes the effect as “small,” although by 2003 the effect documented by the Global Consciousness Project was already very dramatic indeed, having a p-value of less than .000001. The cumulative effect has increased every year, as the effect has continued. The effect now has a p-value of about 1 in 10 trillion, as discussed here, an effect billions of times greater than the p-value in countless other studies reported by the New York Times. But although the results have grown ever more dramatic since 2003, there hasn't been a New York Times story on this in 13 years, and there has been no New York Times story that accurately reported the results produced by this project. Another important paranormal news item during recent years has been the phenomenon of orbs, unexplained balls of light which photographers all over the globe have been photographing in great abundance since about 1990. Photos often show them moving at extremely fast speeds, and in a variety of bright colors, in quite normal clean air, indoors and outdoors. Not only do mysterious orbs appear abundantly in photos and youtube.com videos, but they are often seen visually by people who report seeing them in the sky (there have been 12,000 such reports in the past 3 years, as discussed here). But the only coverage the New York Times seems to have given this topic in the past 11 years is a 2005 story of orbs at one particular person's house, with no mention of anyone else observing them (and the story made sure to trot out a completely unworkable explanation for the phenomena it described). Ironically, the orbs news story the Times has been completely ignoring for a decade is abundantly evident in its own backyard, because this link shows photos of hundreds of orbs (often fast-moving, colorful and bright) taken at Grand Central Terminal, a rather short distance from the New York Times building. Another important paranormal news item was the release of the AWARE study, a study on near death experiences. The study (discussed here) was authored by a large team of scientists and physicians. The study told the astonishing case of a 57-year old man who reported floating out of his body and witnessing his operation from the top of his hospital room. The man said that a woman appeared in a high corner of the room, beckoning him to come up to her. He said that despite thinking that was impossible, he found himself up in the high corner of the room, looking down on the medical team trying to revive him. The man described specific details of the revival efforts, including the presence of a bald fat man with a blue hat, a nurse saying, “Dial 444 cardiac arrest,” his blood pressure being taken, a nurse pumping on his chest, a doctor sticking something down his throat, and blood gases and blood sugar levels being taken. This is a most newsworthy story of a near-death experience in which a person's “out-of-body” observations during surgery were verified. It's reported in a scientific paper. But did the New York Times cover this study this after the study was released? Apparently not. 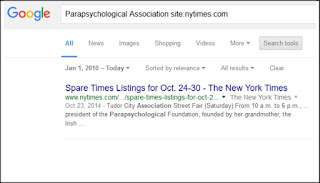 When I do a Google search using “AWARE study site:nytimes.com” and “Sam Parnia site:nytimes.com” (using the study's lead author) I get no results referring to the study. 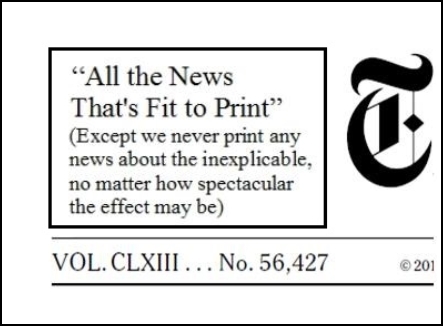 It is hard to resist the conclusion that for the past 30 years the New York Times has been following a policy of censoring the paranormal or describing it in an unfair, inaccurate or uninformative way, in the rare times the paper covers the paranormal. In this matter it rather seems the New York Times wants you to keep wearing horse blinders that keep you from seeing strange things on your left and your right. Apparently the New York Times wants its readers to believe they live in a bland James Randi/Richard Dawkins type of world in which big UFOs don't appear, people don't see ghosts, anomalous things don't appear in photos, no one has weird psychic experiences, and strange inexplicable things don't happen. The world we actually live in is a totally different type of place. Let us imagine if extraterrestrial visitors were to arrive, and to start a gradual year-long program of gradually revealing their existence to humans. Imagine that in January they sent their vehicles over many cities in the US. Suppose that in March they caused gigantic crop circles to appear all over the Midwest US. Suppose that in June they burnt giant alien symbols in the sides of many mountains. Imagine that in September their ships were seen in the sky by 50,000 people. Imagine that in November giant moon-sized UFO's were seen in huge triangle formations over every large US city. Finally let us suppose that in December a giant UFO the size of a football stadium appeared hovering directly over the White House. You would never read about any of this in the New York Times, except until December, when the New York Times would report (in small print in its back pages) that the giant UFO seen over the White House was just a cloud with an unusual shape. There exist numerous cases of what look like very strong fine-tuning in our universe. Both fundamental constants and natural laws are arranged in a way that allows for us to exist. It seems that the probability of all of these favorable conditions existing by chance is incredibly low. It has been argued that the probability of you existing in a universe as fine-tuned as ours is like the chance of you surviving a firing squad (having 10 or more soldiers firing their rifles at you at close range). If you survived a firing squad, it is argued, you should assume there was some purpose involved in this, and that it wasn't just a lucky accident. What type of universe should we expect to observe? Why, of course, it is only a universe as fit-for-life as our universe, because that is the only type of universe that could have observers. So there is an “observer selection effect” such that all observers find themselves in universes like ours, and it is not surprising that we exist in a universe like this. In regard to that firing squad analogy, you should not be surprised to find yourself alive after facing a firing squad. This is because there is an “observer selection effect” which guarantees that all people who make observations after facing a firing squad are those who survived the firing bullets. Let's examine such reasoning in detail, first examining the simpler case of the firing squad. When reasoning involving an observer selection effect is used in regard to firing squads, this “observer selection effect” is an example of what is called a red herring. A red herring is an argumentative device in which a person introduces some irrelevant or less relevant consideration, perhaps to distract you from considering a more relevant consideration. It may be true that only alive persons could observe themselves as survivors of a firing squad, but such a fact doesn't make you the slightest bit more likely to survive a firing squad. So this “observer selection effect” claim is just a red herring. But in regard to statements such as, “You should not be surprised to find yourself surviving a firing squad, because that's the only thing you could observe,” is there any validity to such reasoning? No, there isn't. In this case, it must be remembered that the case of a non-observation (no observation of anything, because you're instantly killed) is both a distinct possibility and a high likelihood. So we should not make the mistake of assuming that some observation must necessarily occur. Here are some examples of correct statements and incorrect statements. Incorrect statement: Of course, after you finish high school, you'll end up in Harvard with a nice dorm. Everyone knows a school like Harvard can afford nice dorms. Correct statement: No, I almost certainly will not get such a dorm, because I almost certainly won't get into Harvard. Incorrect statement: You can look forward to marrying a gorgeous starlet, because pretty much the only type of people who get to be movie starlets are gorgeous people. Correct statement: No, I almost certainly won't marry such a starlet, because its way too improbable that I would marry anyone who is a starlet. 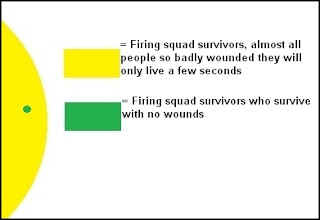 Incorrect statement: You shouldn't be surprised to survive a firing squad, because the only observation you could have after facing such a squad would be to observe that you survived. Correct statement: No, I should be supremely surprised to survive a firing squad, because if I faced such a squad, it would be almost certain that I should be instantly killed and have no further observations. The most persuasive (but devious) way to appeal to an observer selection effect is to present a loaded question, a type of question that makes an unfair assumption, as in the famous question asking: when did you stop beating your wife? The loaded question in the case of the firing squad might be: what should you see around you after facing a firing squad? Such a question is trickily phrased in a way so that the answer of survival is already answered. But such trick questions can always be answered though careful replies, as below. Incorrect statement: What should you expect to observe after facing a firing squad? Only that you had survived, because otherwise you could make no observation. Correct statement: You should not expect to observe anything at all after facing a firing squad, because you should be immediately killed by its bullets. Another way to clarify the situation of the firing squad is to do what we may call an exhaustive possibility analysis. When we do such an analysis, rather than just considering two possibilities, we will try to consider every possibility. We can then consider the likelihood of each possibility. Possibility 1: You immediately die when the bullets kill you, and have no further observations. Very, very likely (unless your soul survives your death). Possibility 3: You survive for a while, with very heavy wounds that will very soon cause you to die. Unlikely, but much more likely than Possibility 2. When we consider all of these possibilities, it becomes clear that any type of “you should not be surprised to find yourself surviving a firing squad” reasoning (based on an observer selection effect) is utterly invalid, particularly if “survive the firing squad” means to end up in pretty good shape when the firing squad is finished. The most likely possibility is that you should instantly be killed by the firing squad, and have no observations after hearing the firing of the guns. The second most likely possibility is that you should be very heavily wounded after facing the firing squad, and have only a pitifully short observation before dying. Possibility 4 (being alive and not wounded) is extremely unlikely both in the full group of possibilities and also in the subset of possibilities that include some type of observations by you after facing the firing squad. It is not at all correct to suggest that some type of observer selection effect will make it likely that you will observe yourself in a good state after facing the firing squad. Now let's look at the case of habitable universes. The reason why I spent so much time discussing firing squads is that the situation in regard to habitable universes has a strong similarity to the firing squad situation. Here are the similarities: dying instantly in the firing squad is similar to a universe that is uninhabitable; being heavily wounded by the firing squad is similar to a universe that is just barely habitable; and surviving the firing squad without any wounds is similar to a universe that has no shortfalls in regard to habitability, which is the type of universe we find ourselves in. Before trying to do an exhaustive possibility analysis, let us consider the type of “observer selection effect” arguments made in regard to habitable universes. Below are some examples, along with corrections. Incorrect statement: We should not be surprised to find ourselves living in a finely tuned habitable universe, because the only type of universes that have observers are finely tuned universes. Correct statement: We should be very surprised to find ourselves living in a finely tuned habitable universe (under assumptions of randomness), because it is vastly more likely that our universe should have been uninhabitable and not allowed us to exist as observers. Incorrect statement: The fine-tuned nature of our universe is just as we should expect, because such conditions are prerequisites of our existence. Correct statement: Under the assumption of randomness, the fine-tuned nature of our universe is incredibly surprising and improbable, given that there is nothing necessary about our existence. Now let's try to do an exhaustive possibility analysis regarding types of universes and what type of observers (if any) they might have. This will include some interesting possibilities that are often overlooked. Possibility 3: The possibility of a barely habitable universe having some serious shortfalls in regard to habitability, but one in which observers are just barely possible. 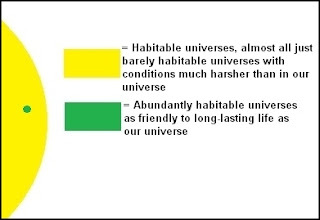 Very unlikely, but much more likely than Possibility 2, because the list of conditions that must be met for a barely habitable universe is much shorter than the list of conditions that must be met for a universe such as ours (as argued here). `When we consider all of these possibilities, it becomes clear that any type of “you should not be surprised that our universe is like this” reasoning (based on an observer selection effect) is utterly invalid, particularly if “a universe like this” means a universe about as habitable and life-friendly as our universe. Under assumptions of randomness, the most likely possibility is that a universe should be uninhabitable and lifeless. The second most likely possibility is a universe that is just barely habitable, with conditions much harsher than ours (such as a universe with no stars or very few stars or a universe in which either carbon or oxygen was rare). Such a universe is probably at least a thousand times easier to achieve by chance than a universe such as ours (for reasons explained here). Possibility 2 (a universe as hospitable to life as ours) is extremely unlikely both in the full group of possibilities and also in the subset of possibilities that include some type of observers. It is not at all correct to suggest that some type of observer selection effect will guarantee that observers only exist in a universe with a level of fine-tuning as great or almost as great as ours. The most devious trick of those who evoke an observer selection effect is to phrase questions such as “What type of universe should we expect to be living in?” This is a loaded question, one that has a particular assumption built in to it (like the famous loaded question which asks when did you stop beating your wife). The very phrase “should we expect to be living in” presupposes a universe with an observer. Incorrect statement: What type of universe should we expect to be living in? A universe like the one we do live in, for in no other universe can there be observers. Correct statement: You are asking a loaded question if you ask what type of universe should we expect to be living in, because the phrase “to be living in” presupposes habitability. Avoiding such a loaded question, we should ask: what type of universe should we expect our universe to be? Under the assumption of randomness, the answer is: an uninhabitable universe in which no observers ever existed. And in the very unlikely case that our universe happened to be habitable, the most likely case by far would be that it should be just barely habitable, since the requirement list for such a universe is much shorter. Such a barely habitable universe would be much less life-friendly than ours. Let's imagine a hotel casino where there's a special room called the Big Gamble. You have to pay $10 to get into the room, where you find a giant laser above your head. There's a lever you pull to try your luck. After you pull the lever, there is a 99.9999% chance that the laser will instantly incinerate you, reducing you to a charred cinder. But there's one chance in a million that you'll get a jackpot of 5 million dollars. Let's imagine a conversation between a gambler and a casino employee who gets a commission on all the people who try the Big Gamble. Gambler: I was thinking of trying the Big Gamble, but I'm afraid it will probably just get kill me. Casino Employee: Go ahead, take a chance! Gambler: But I just can't see myself winning the 5 million dollars. That would be too surprising. Casino Employee: Well, I can see you're just ignoring the “observer selection effect” here. Casino Employee: Well, it works like this. If you don't get incinerated, and win the 5 million dollars, it won't be surprising at all. Because the only person who could have an observation after pulling the lever is a person who survived, and won the 5 million dollars. So you won't be surprised to have survived, because it's the only kind of observation you could have after pulling the lever. Gambler: So it's not such a long shot that I'll win the 5 million? Casino Employee: No, when you look at it as I just discussed, it won't be surprising at all. Gambler: Okay, I'll make the bet. The casino employee has used the classic argumentative technique of the red herring, something that distracts you from concentrating on what you should be concentrating on, and diverts you into thinking about some irrelevant distraction. In this case, whether or not you will be surprised by still being there after trying the Big Gamble is irrelevant. What is the relevant consideration is the probability of you winning. The reasoning of the casino employee is utterly sophistical and fallacious, and when similar “observer selection effect” reasoning is used on a cosmic scale when arguing about universes, it is just as irrelevant and misleading as this casino employee's sales pitch. Last Sunday night the National Geographic television channel offered us a special on near-death experiences, entitled “Return From the Dead.” It was the silliest treatment of the topic I've ever seen on TV. It showed a Belgian professor Stephen Laureys as he tried various attempts to get insights about near-death experiences. Laureys first attempt to get an insight about near-death experiences was truly laughable. He went to one of those fancy expensive centrifuge machines like they use to train astronauts to handle high g-forces during rocket launches. He went round and round in the machine, until he got a little tunnel vision. This, Laureys insinuated, is something that helps to explain the part of near-death experiences in which people often report traveling through a tunnel. Such an insinuation is quite ridiculous for two reasons. First, the people who have near-death experiences are not being subjected to anything like high g-forces, so experiments with high g-forces tell us nothing about near-death experiences. Second, having an experience in which you seem to speed through a tunnel is a perceptual event very different from tunnel vision. Tunnel vision is simply where your vision is blocked or blurry except for a clear hole in the middle of your field of view. Tunnel vision is an example of perceptual restriction, but those who have near-death experiences rarely report such a thing. Instead, they often report quite the opposite, an effect of floating out of their bodies and having their visual perceptions enhanced, as if they could see more clearly than ever before. Laureys next attempt to get an insight about near-death experiences was just as silly. He consumed some hallucinogenic substances called magic mushrooms. Then he had some trippy experience which he compared to the transcendental flavor of a near-death experience. Does this do anything at all to help explain near-death experiences? No, because people who have near-death experiences are not people who have used hallucinogenic drugs before having the near-death experience. Laureys next attempt to get an insight about near-death experiences was an exercise in irrelevancy. He went into a sensory deprivation chamber which he said caused him to hear some voices that weren't there. This tells us nothing about near-death experiences, because such experiences are not preceded by periods of conscious sensory deprivation. Also, the type of hallucinations produced by such sensory deprivation chambers (described in this Wired story) do not resemble near-death experiences. Laureys next attempt to get an insight about near-death experiences was as goofy as his first try. To try to help understand the component of near-death experiences in which people report floating out of their bodies, Laureys fooled around with some very elaborate high-tech virtual reality setup that includes a plastic dummy arm. This somehow produces some kind of perceptual anomaly that Laureys compares to floating out of your body. Does this do anything at all to help explain near-death experiences? Not at all. The first reason is that Laureys is exaggerating like crazy, because the minor perceptual weirdness he reports is something vastly different from an experience in which someone reports floating above their body and viewing their body from above. The second reason is that the people who have near-death experiences do not have them under any conditions even slightly comparable to the condition of being hooked up to some elaborate virtual reality machine. Laureys approach is as silly as someone trying to explain ghosts by filling up a room with steam blasts and then taking pictures of steam blasts that look a little like ghosts. That would be batty, because people who report seeing ghosts don't see them under any such “steam rich” conditions. Similarly, no one reports out-of-body experiences under any conditions like the high-tech virtual reality conditions Laureys was playing around with. At this point in the show Laureys waxes triumphantly about all the “insights” he is gaining into near-death experiences from his goofy excursions into the irrelevant. The show ended with kind of a “mad scientist” moment, as we see some experiments in which subjects are walloped with oxygen deprivation. The goal is clearly to try to show that near-death experiences are caused by oxygen deprivation. The oxygen-starved people are then questioned. We have some cherry-picked clips of a handful of people mentioning something that might be relevant to near-death experiences. There was no clip of anyone reporting something like a full-blown near-death experience, or even a clip of anyone reporting two different aspects of a near-death experience, nor did the narrator mention any such person. But one woman said it was kind of like floating around. Does this do anything to support the idea that near-death experiences may be caused by oxygen deprivation? Not at all, when you consider the suggestibility factor. Previous studies have shown that people are astonishing suggestible to figures in white coats conducting experiments. A classic example was the Milgram experiment which showed that people would turn a knob that they thought was producing an almost lethal dose of electricity to someone, as long as there was an authority figure in a white coat telling them to “please continue.” Now let's imagine a scientist who asks for volunteers for an experiment on whether oxygen deprivation will cause something like a near-death experience. This will create a kind of feeling in the volunteer's mind that the scientist hopes or expects that the volunteer will report something a little like some part of a near-death experience. Even if the scientist makes no mention of near-death experiences when asking for volunteers, but merely asks for volunteers for an experiment on oxygen deprivation, it is all too likely that some of the volunteers would realize or suspect that the experiment is really about whether oxygen deprivation causes near-death experiences. In fact, there may be a selection effect in which the people who sign up for such experiments tend to be people wanting to help debunk near-death experiences. Did you experience any of these? __ A white light in front of you? __ A feeling of joy? __ Recall of previous experiences? __ A sense of floating? __ A kind of mystical feeling? __ A feeling like traveling through a tunnel? __ Seeing one of your relatives? Of course, your volunteers will sense that you really want them to check one of these boxes, so almost certainly you will find a few of the questionnaire items are checked off. But you will not be entitled to claim any insight about near-death experiences from such an experiment. You will have merely shown human suggestibility. 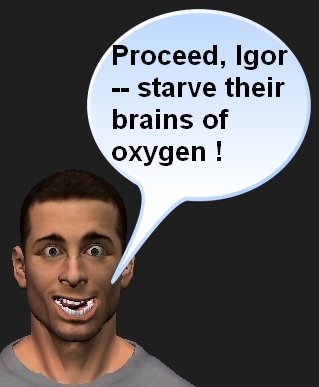 Given the practical impossibility of randomly selecting people and subjecting them to oxygen deprivation without warning (the only way to avoid suggestibility issues and bias issues), the soundest way to determine whether oxygen deprivation produces something like near-death experiences is to check the unsolicited accounts of people who suffered oxygen deprivation while flying, mountain climbing, or diving. Such accounts (which have been written for centuries) will provide no support for the claim that oxygen deprivation can explain near-death experiences. This scientific paper reviews the effects of oxygen deprivation (called hypoxia) and makes no mention of any effects resembling that of a near-death experience. Far from reporting the type of ecstasy often reported in such experiences, the paper reports that there was no change in the reported feelings of subjects undergoing oxygen deprivation: "self-reported feelings did not differ between the hypoxic and normoxic sessions." So the insinuation of the National Geographic TV show that oxygen deprivation can explain near-death experiences is bunk. Laureys once co-authored a good paper on near-death experiences, one finding that the memories from them are kind of "realer than real." But judging from Sunday's TV show, his current approach to the topic seems to be to engage in various types of irrelevant busy work, and claim that these provide "insights" into near-death experiences. Acting in a similar way, you might do some experiments involving illegal aliens from Mexico, and then claim that these provided insights on aliens in distant solar systems. Theories are neither hunches nor guesses. They are the crown jewels of science. A theory, likewise, represents a territory of science. Instead of rivers, hills, and towns, the pieces of the territory are facts. So generally speaking, scientific theories are made up of facts, and no guesses? Hogwash. Rubbish. Zimmer is apparently a science theory fanboy who we can expect to receive a scientific theory with the same reverent enthusiasm that a trekkie might receive the next installment of the Star Trek franchise. (The Merriam-Webster online dictionary defines a fanboy as “a boy or man who is an extremely or overly enthusiastic fan of someone or something.”) Let's look at some things that conflict with this naive attitude toward scientific theories. Consider some of the weird scientific theories that are floating about these days. There is the Everett “many worlds” theory of parallel universes, which imagines that the universe is constantly splitting up into different copies of itself, and that there are a zillion copies of you in different alternate universes, where everything imaginable occurs. Then there's the Integrated Information Theory which tries to explain consciousness in a way that implies that your thermostat and cell phone are partially conscious. Then there's the so-called “landscape” version of string theory, which unnecessarily imagines something like ten to the five hundredth power universes, each of which is a different permutation of string theory (a speculative branch of physics that is entirely unproven). Then there's Smolin's theory of cosmological natural selection, which gives us the groundless speculation that certain type of stars spit out new universes when they die. Then there's the panspermia theory that life began on Earth because aliens planted it here. Then there is Freud's theory that you have deep-rooted conflicts caused by your subconscious sexual attraction to your mother. Then there are neurological theories that your self is just an illusion. Zimmer would have us believe that scientific theories are in general “crown jewels,” but it seems that some scientific theories are more like junk than jewels. But isn't it at least correct that most scientific theories are true? No, it isn't. Scientists love to churn out speculative theories, particularly physicists and cosmologists. There are countless different versions of what is called the cosmic inflation theory, each making different assumptions. Presumably no more than one of these different versions can be true. There are countless other scientific theories describing different variations of the Big Bang, different configurations of our universe, and different eventual fates for our universe. Probably the great majority of these are false. There are countless different attempts to describe a physics beyond the Standard Model. The great majority of these theories must be wrong, as they all make assumptions that conflict with each other. A similar thing probably holds true about theories in fields such as neurology and psychology. I may note that there is absolutely no ethic in science that a scientist should regard a theory as being probably true before he publishes a paper suggesting it. Quite to the contrary, there is a “publish or perish” ethic under which it is considered just fine to publish a paper suggesting some oddball theory that probably isn't true, particularly if it is mathematically interesting or is an interesting twist on some other theory or if it is an idea that somehow might cause someone to think of a theory that is probably true. When Harvard professor Abraham Loeb came up with an extremely implausible but interesting and innovative theory about life evolving in the first few million years of the universe's history, his colleagues probably thought it was nice work. But is it true that we can tell that some scientific idea is solid when it is called a theory? No, it isn't. The claim that scientists only use the word “theory” for well-established ideas with lots of evidence behind them is pure bunk, a groundless piece of folklore typically trotted out when making the case for some theory that has insufficient evidence behind it. What proves this is that the completely unsubstantiated set of ideas called “string theory” is referred to under just that name by scientists and non-scientists, not some other name such as “string hypothesis.” Scientists pretty much use the word “theory” just like ordinary people use it. But is it true, as Zimmer claims, that in the world of science “theories are neither hunches nor guesses”? As a general claim about scientific theories, that is false. A sizable fraction of modern scientific theories are highly speculative theories largely consisting of guesses. In fact, many scientific theories are guesses piled up on top of other guesses. When the cosmic inflation theory was introduced, it was a wild guess about details of the first second of the universe, which was built upon other wild guesses about the universe (a class of speculative theories called grand unification theories). Neither of these wild guesses has been confirmed, but the cosmic inflation theory is still influential. Heaping speculations upon speculations is typical behavior for the modern theoretical physicist. Do any of the theories of science deserve to be called “crown jewels,” the term so carelessly used by Zimmer as a general characterization of scientific theories? Yes, but only a small few. The scientific theories that are “crown jewels” are mainly those that make exact numerical predictions that have been repeatedly proven to be true. Some examples I can think of are the theory of gravitation, the theory of electromagnetism, and the kinetic theory of matter (particularly when it predicts the behavior of gases). The table below lists some different categories of scientific truth-claims, distinguishing between well-supported claims and claims that are not well-supported. 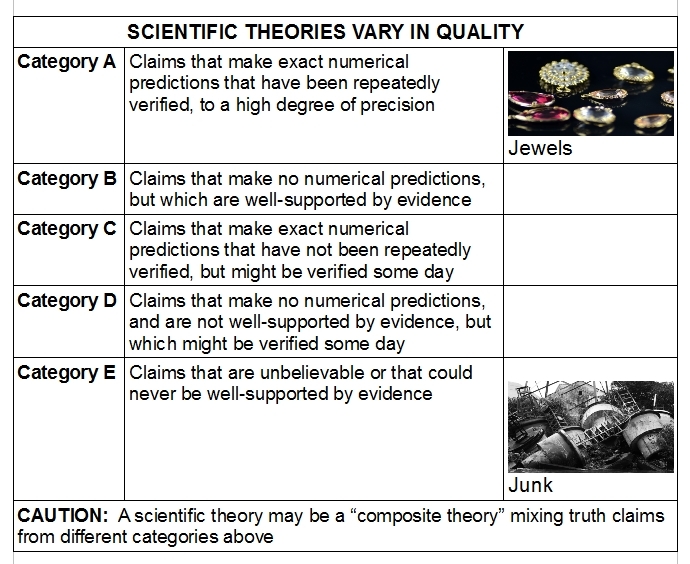 Only the tiniest fraction of scientific theories fall into the first category. What can be particularly confusing is that a particular set of ideas called a scientific theory may be what we can call a composite theory, meaning a theory consisting of different types of truth claims, some being well-supported and others being not well-supported. Given such composite theories, it may be quite hard to sort out whether some, all or most claims in a scientific theory should be believed. There is no reliable shortcut to evaluating most scientific theories. You cannot simply rely on a scientific consensus, because there may be strong sociological, ideological and “bandwagon” factors that may cause a majority of scientists in some field to endorse a theory which is not actually worthy of belief, or that contains some unworthy parts. There is no substitute for rigorously analyzing the individual truth claims that make up a scientific theory, and evaluating each such claim in a critical light, demanding supporting evidence for each claim, listening to opposing arguments, and rejecting any part of a theory which is not well-supported by facts or evidence. It's okay to be a nature fanboy, but don't be a science theory fanboy who reverently receives the latest dubious theoretical claim floating on gossamer threads of thought. Be someone who analyzes scientific theories in the same probing, questioning way that you might analyze the truth claims of a salesman in a used car lot. In my previous post I discussed cosmic habitability categories, which involve four possible types of universes: uninhabitable universes (in which life can't exist), barely habitable universes (in which it is very hard but just barely possible for intelligent life to exist), moderately habitable universes (offering more favorable conditions), and abundantly habitable universes (in which life might be able to evolve all over the universe, with many planets having life all over them, and intelligent life having great prospects for being able to survive for eons). It seems that our universe is the fourth type of universe, as it does not have any serious shortfall in regard to habitability. Now let us consider two interesting questions: (1) which of these types of universes are the most likely and the second-most-likely to exist? (2) what type of prediction about the habitability of the universe is implied by scientific materialism? Uninhabitable universe: A universe in which intelligent life cannot evolve anywhere, because it is missing one or more of the habitability necessities. Barely habitable universe: A universe that has all of the habitability necessities, but none or only one or two of the habitability boosters. Moderately habitable universe: A universe that has all of the habitability necessities, and roughly half of the habitability boosters. Abundantly habitable universe: A universe that has all of the habitability necessities, and all or almost all of the habitability boosters. So to delve into the relative likelihood of these types of universes, we must consider first : what is the chance of the habitability necessities occurring? Then we can consider what is the chance of the habitability boosters occurring. The first habitability necessity I mentioned was stable atoms heavier than hydrogen. We take heavy elements such as carbon and oxygen for granted, but we shouldn't. We should not expect them to exist in more than a very tiny fraction of all random universes. You wouldn't have atoms other than hydrogen unless you have the strange convenience we call the strong nuclear force, which binds together nuclei together, overcoming the electromagnetic repulsion between protons. First such a force must exist. Second, it must have the right strength level (and it is actually the strongest known force). You must also have electromagnetism causing a force of attraction between protons and electrons, which keeps electrons in an atom. Then you need quantum mechanical laws that prevent such attraction from causing electrons to fall into the nucleus. Given all of the ways you can wrong, it seems the chance of atoms existing in a universe of random constants and forces is very low. The second habitability necessity I mentioned was planets with a reasonable level of gravity. To meet this necessity a universe needs a universal force of gravitation that is attractive. The very existence of such a force would seem to be no more than a one-in-three likelihood, since we can imagine two other equally likely possibilities (a universe with no such force at all, and a universe with a force of repulsion between all particles). But the likelihood of habitable planets in a random universe is actually much, much smaller than that. For one thing, the strength level of gravitation (signified in our universe by the gravitational constant) must be within a quite narrow range of values. If gravitation is too weak, planets won't hold together. If gravitation is too large, then the gravity on all planets will so great that no animals will be able to move around on a planet (and there are also reasons why an expanding universe would have collapsed into black holes if gravitation had been much higher). There is also fine-tuning required in regard to the proton charge and the electron charge. For example, in our universe if the proton charge and the electron charge were not exactly the same, gravitation would not be enough to hold planets together (since the electromagnetic force is roughly a trillion trillion trillion times stronger than the gravitational force, even a relatively tiny difference in the proton charge and the electron charge would cause repulsive effects exceeding the attractive effects of gravitation in large bodies such as planets, preventing their existence, as mentioned by Greenstein here). The likelihood of a random universe being habitable seems even smaller when we consider the third habitability necessity I mentioned, the necessity of having a relatively empty vacuum. The issue (discussed here) is that according to quantum mechanics, quantum fluctuations should cause the vacuum to be teeming with energy. This is the “vacuum catastrophe” problem or cosmological constant problem that is perhaps the biggest unsolved problem in physics. According to the predictions of quantum field theory, we should live in a vacuum that is at least 1060 times denser than the observed vacuum – so dense that a square meter of the vacuum should be denser than a square meter of steel. Pretty much the only idea physicists have as to why our vacuum is so relatively empty is that there was some fantastically improbable and coincidental “cancellation of contributions” leaving us with a nearly empty vacuum – something rather like the annual savings of Chinese citizens coincidentally matching the annual credit card charges of US citizens, with an exact match to the penny. The chance of such a thing in a random universes is very, very low. The likelihood of a random universe being habitable seems even smaller when we consider the fourth habitability necessity I mentioned, the necessity of having both carbon and oxygen in the universe. Scientists have discussed how if the strong nuclear force had been slightly weaker or slightly stronger, we would have been left with a universe that would have had either lots of carbon but no oxygen, or lots of oxygen but no carbon. Apparently getting both required a lot of luck that would be very unlikely in most random universes. 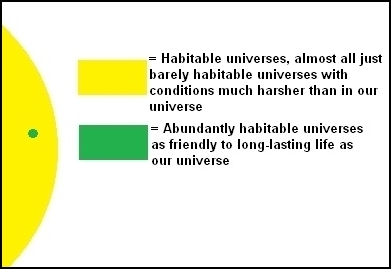 Based on these considerations (which do not at all discuss all of the habitability necessities of a habitable universe), we can conclude that uninhabitable universes are vastly more likely than habitable universes. Such a conclusion has been made by quite a few previous scientists. A recent article by physicist Luke Barnes has a relevant graph showing habitable universes as just a small portion of a parameter space that is much bigger (and there are lots of bulls-eyes that nature must hit for a universe to be habitable, not just the one illustrated here). The conclusion above has been made by many writers, but now let's look at a question rarely considered, but quite important: in the class of all habitable universes, what fraction should be we expect to be just barely habitable? In other words, should we expect that barely habitable universes are vastly more common than moderately habitable universes and abundantly habitable universes? I will now argue that we should expect exactly that, mainly because the habitability boosters that I identified are unlikely to occur in random universes. Let's look at the first habitability booster I identified, the existence of radiant stars. The likelihood of you getting radiant stars in a random universe is discussed in section 4.7 of the scientific paper here. The paper quotes a scientific paper by Adams mentioning a 1 in 4 chance of stars being possible if you allow the fine-structure constant and the gravitational constant to have values differing from their current values by ten times. But this is an example of “putting the camera near the needle hole in order to make the needle hole look big.” There's no reason why the the fine-structure constant and the gravitational constant could not have values a million times smaller or larger. When we properly consider that, we are then left with a probability of less than 1 in a million that a random universe would have radiant stars. See here for more on this issue. On page 40 of this paper, physicist Luke Barnes says, “We conclude that the existence of stable stars is indeed a fine-tuned property of our universe” – in other words, something that would be very unlikely to occur in a random universe. Another habitability booster I mentioned is the existence of large amounts of both carbon and oxygen. Scientists have identified this as something that would not occur unless fundamental constants are fine-tuned. According to page 41 of this paper, a 1 part in 100,000 change in one fundamental constant would change things so that the main stellar process producing carbon and oxygen would produce either carbon or oxygen, but not both. That paper concludes, “The ability of stars in our universe to produce both carbon and oxygen seems to be a rare talent.” So we can conclude that this habitability booster (an abundance of both carbon and oxygen) is highly improbable in a random universe. Another habitability booster I mentioned is low radioactivity. For simplicity let's just assume there is maybe 1 chance in 2 of such a condition. It would seem to be many times harder for a universe to have the last habitability booster I mentioned, that of low static electricity (so there are not all kinds of lethal static electricity amounts hanging around all over the place, ready to kill anyone who touches them). Low static electricity seems to require two different coincidences: the coincidence that the number of protons in a universe roughly equals the number of electrons (as it seems to do in our universe), and the coincidence that the proton charge equals the electron charge (as it does in our universe, to twenty decimal places). If you change those conditions just a little, you will be left with a universe in which there is so much free-floating static electricity (excess charges floating about) that life should be very rare, very short-lived or both (imagine a planet teeming with billions of “static electricity landmines” and you'll get the idea). So speaking very generally, not only are the habitability necessities rare strokes of luck that should be very unlikely to occur in a random universe, but also the habitability boosters are almost all rare strokes of luck that should be very unlikely to occur in a random universe. Consequently, barely habitable universes should be vastly more likely than moderately habitable universes or abundantly habitable universes. Barely habitable universes should be much more likely because they require much fewer “improbable strokes of luck” than moderately habitable and abundantly habitable universes. The visual below illustrates this idea. 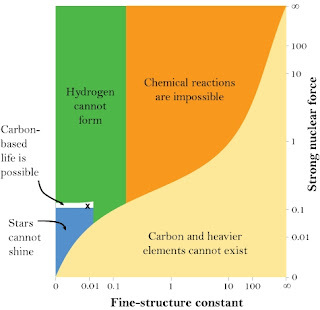 This is a very schematic visual, and its proportions are not supposed to represent the actual ratio between different habitability categories. The visual refers merely to probabilities, not actualities. In the first bar we see something that represents very roughly a ratio between uninhabitable universes and habitable universes (although the actual fraction of habitable universes should be much smaller). The second bar is a closeup of the right edge of the first bar. When we zoom in and look at the habitable universes, we find that almost all of them are barely habitable universes, with a few (on the right side) being moderately habitable. The third bar is a closeup of the right edge of the second bar. When we zoom in and look at the universes that are better than barely habitable, we find that almost all of them are moderately habitable and only a tiny fraction are abundantly habitable. Although this visual is highly schematic, I think it gives a rough idea of the relative probabilities of a random universe being uninhabitable, barely habitable, moderately habitable or abundantly habitable. What Prediction Does Scientific Materialism Make About Our Universe's Habitability? Now let us consider: what type of prediction does scientific materialism make about the habitability of our universe? The answer is: it makes a prediction that could not be more wrong. The actual prediction that scientific materialism makes about the habitability of universe is that our universe should be about the most uninhabitable universe imaginable. This is because of the long-standing problem in physics known as the cosmological constant problem or the vacuum catastrophe problem. Because of weird quantum mechanical considerations, physics predicts the vacuum of space should be seething with a very dense sea of virtual particles, particles that should cause each cubic meter of space to have more mass-energy than solid steel. Under such conditions, no type of life could exist for even an instant – it would be easier for life to exist in the middle of the sun. So what we get from scientific materialism is the prediction that the universe should be as uninhabitable as anything we can imagine. But suppose we grant a special favor, and simply ignore the predictions of quantum mechanics. Suppose we pay no attention to the whole cosmological constant problem and vacuum catastrophe issue that physicists have been puzzled by for forty years. What type of universe does scientific materialism then predict? It then still predicts that our universe should be an uninhabitable universe. This is simply because an uninhabitable universe should be trillions of times more likely than any type of habitable universe. That's because of all the extremely improbable long shots and coincidences for a universe to meet the habitability necessities I have mentioned (and others I haven't mentioned). But what if we grant a second special favor, and assume that observers must exist in a universe, perhaps by using some kind of dubious “selection effect” reasoning or “anthropic principle” reasoning. There is no sound basis for granting such a favor, but suppose we grant it anyway. What then does scientific materialism predict? It then predicts that our universe should only be a barely habitable universe. Why? Because, as we have seen, barely habitable universes should be vastly more likely than abundantly habitable universes like the one we live in. The list of long shots and coincidences that must be met in order to have a barely habitable universe is much shorter than the list of long shots and coincidences that must be met for moderately habitable universes or abundantly habitable universes. So even if we grant two special favors, scientific materialism still makes the wrong prediction about what type of universe our universe should be. But what if we throw in a multiverse – the assumption that there are many universes? Does that help? No, it doesn't help at all. The habitability predictions of scientific materialism regarding our universe are not changed at all if we assume that there are many universes. It is a basic fact of probability math (ignored by multiverse enthusiasts) that you do not increase the chance of success on any one random trial by increasing the number of random trials. The predictive failure of scientific materialism in this regard is very spectacular. It's a predictive failure far worse than has ever been made by any errant gypsy fortune teller or any misguided apocalyptic preacher. A failure this spectacular is a sure sign of underlying false assumptions. What we need is a worldview that predicts that our universe should be a type of universe like the type that it is, an abundantly habitable universe.